If you have any doubts or questions about our Expert class Type design course or our Summer school, do not hesitate to visit our Open day on Saturday April 27th. The students and lecturer are eager to answer all your questions! It is the perfect opportunity to see the work of graduates – the group work as well as the individual typefaces –, enjoy the classroom’s atmosphere and get to know the Dr. Frank E. Blokland. Also, during a trial lesson you will get the chance to learn about the influence of calligraphy on type design. Would you like to join? 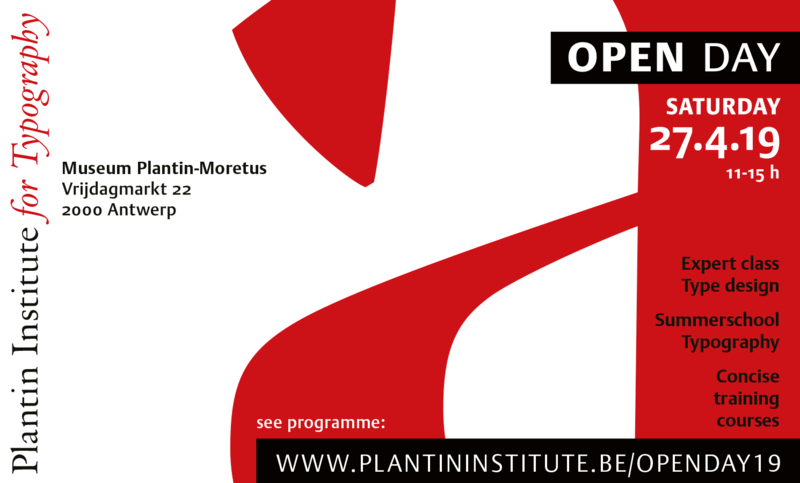 Please send an email to plantin.instituut@antwerpen.be to confirm your attendance and receive a free ticket to visit the Museum Plantin-Moretus afterwards. The Plantin Institute of Typography organises courses on typography and design. The lessons take place in the auditorium in the Museum Plantin-Moretus. As an independent organisation, we offer unique programs combining theoretical insights and historical backgrounds with technical knowledge and practical skills. Most of our lessons are in Dutch. On this website you will find information about our English courses. The practicum Expert class Type design is given annually.